Dan Anderson. By: Dan Anderson. The Foshay Tower in Minneapolis, Minnesota - current home to the W Hotel, Manny's Steakhouse and Keys Café - I remember when it used to tower over the downtown skyline. This art deco gem was built by business mogul Wilbur Foshay in 1929. It was modeled after the Washington Monument and was billed as "the first skyscraper west of the Mississippi". At 448 feet, the Foshay Tower was the tallest building in Minneapolis for over 43 years until that record was crushed in 1972 when the IDS Center was built at 792 feet. 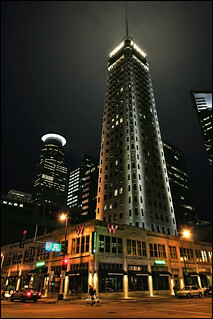 The Foshay is currently Minneapolis’s 16th tallest building. Wilbur lived large in his day making loads of money buying up public utilities and selling their stock - alas, he lost everything in the Great Depression, was convicted of running a massive ponzi scheme and sentenced to Leavenworth prison in 1932 – sounds all vaguely familiar . . . 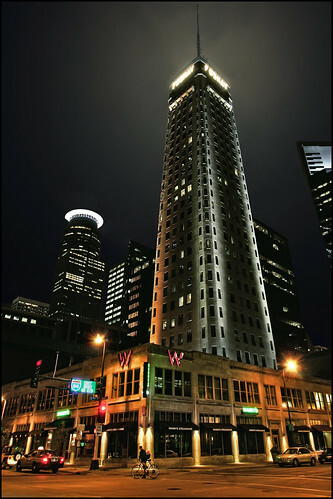 The W Hotel converted Wilbur’s lavish 27th floor private suite into the retro cool Prohibition Bar and operates the Foshay Museum and public Observation Deck with great open views of the city - check it out: W Minneapolis/The Foshay.